When your planning a holiday with friends or family, sometimes staying at an airport hotel is a sure fire way to get your trip off on the right foot. You might have heard that I went to Iceland recently, and we were flying from London Gatwick Airport. 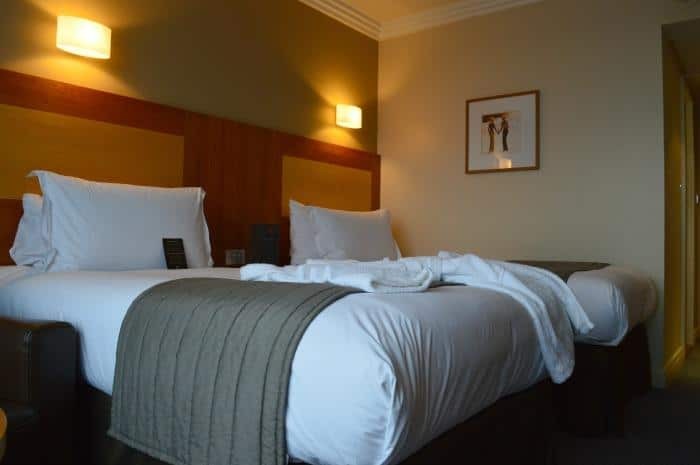 Our flight was at 7am in the morning, so staying at the Sofitel London Gatwick was an ideal way to start our holiday. I was able to drive to London Gatwick Airport from Nottingham at a leisurely pace the day before our trip, without worrying if I was going to hit traffic or be late for my flight. Even better, I avoided having to get up at the crack of dawn and drive on only a few hours sleep. Being a busy parent and freelance blogger, I just don’t cope well unless I’ve had at least 6 hours sleep these days. 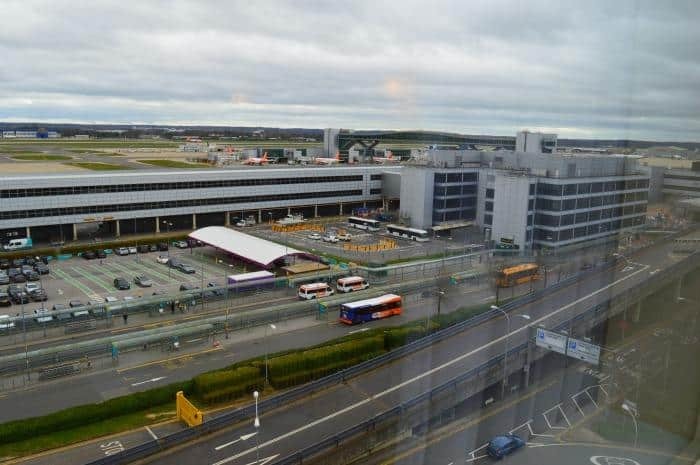 The Sofitel London Gatwick Hotel is directly opposite the North Terminal. The car park is right next door to the hotel, so getting parked and checked in is so straight forward. There’s no need to catch any buses or transport your luggage any more than a few hundred metres to the hotel reception. It’s a great way to get into the holiday mindset from the outset. I took the escalator to the Podium to find reception, and was in ore of what I found. The open space inside Sofitel London Gatwick is really quite impressive and also incredibly calming. The water fountain is surrounded by restaurants and bars where guests can relax before their flight. For the more active traveller, there’s also a Fitness Suite at the hotel. After exchanging some French pleasantries at the reception desk , I was shown to my twin superior room. The thing that caught my attention immediately was the impressive view over the North Terminal. It was great watching the airplanes take off along with the hustle and bustle of the airport without any of the sound. I could have sat at that window for hours watching the world go by if I’m honest. If I had of done though, I would have missed out on the other treats that Sofitel London Gatwick has to offer. 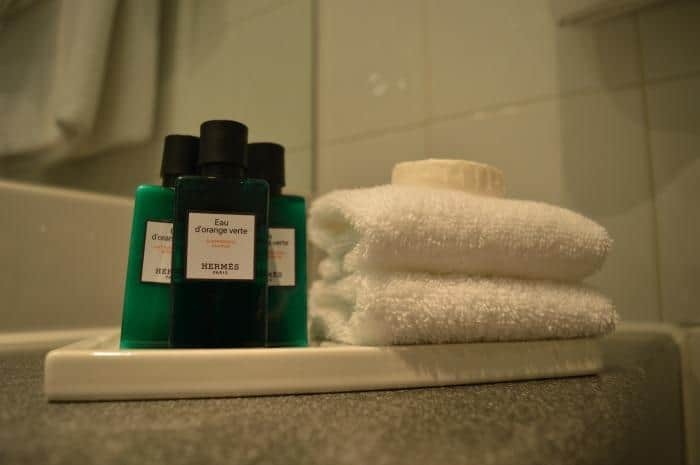 I have to say, the room was meticulously clean and well presented and every detail had been thought about. The robes were soft and comfortable to wear, and the towels were nothing short of luxurious. I loved that the bathroom included a bath mat and loofa as well as some gorgeous toiletries. My travel companion joined me a little bit later, and she was so impressed with the room she was about to abort our trip to Iceland and stay at Sofitel London Gatwick for our holiday. I could totally see where she was coming from with that but Iceland was also calling me. We ate in the Urban Cafe for dinner, and really enjoyed our experience. My friend had the calamari, and a very impressive plate of food was presented to her. I was struck with a terrible bout of food envy when I saw it. I choose the fish and chips, which was lovely but fell a little short along side my friends meal. We decided it was time to get in the glass elevator and go and get ready for bed so that we were ready for our early start. To say the bed was comfortable doesn’t feel like it does it any justice. I think my travel partner summed it up perfectly the next day when she said, ‘that’s the best holiday sleep I’ve ever had’. We were refreshed despite our 5 am wake up call and ready for the day ahead. Before departing, we enjoyed some of the continental breakfast in the hotel. We were served fresh coffee to our table, to compliment some delicious freshly baked croissants. It was just what was needed to get the body clock into gear for our early morning flight. 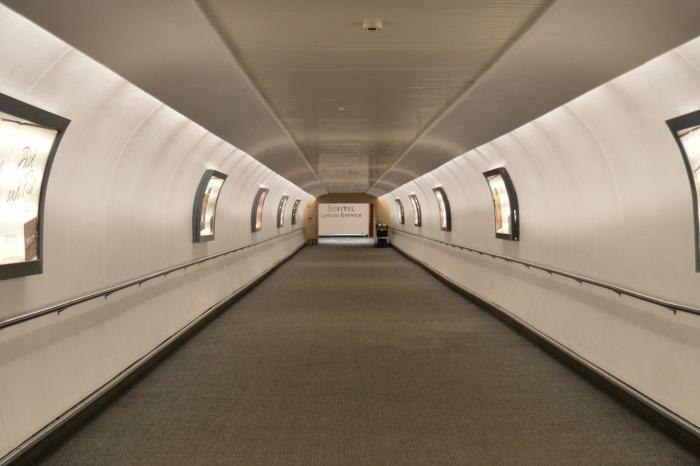 With a little sadness, we said goodbye to the Sofitel London Gatwick and headed through the tunnel that connects directly to the North Terminal. We were through security in minutes, with plenty of time to shop in Duty Free before our flight to Iceland. It was just the relaxed start we needed before heading off on our Icelandic road trip. When we landed in Iceland, I was ready to take on the hire car and a day’s driving all thanks to having such a wonderful and restful stay at the hotel. 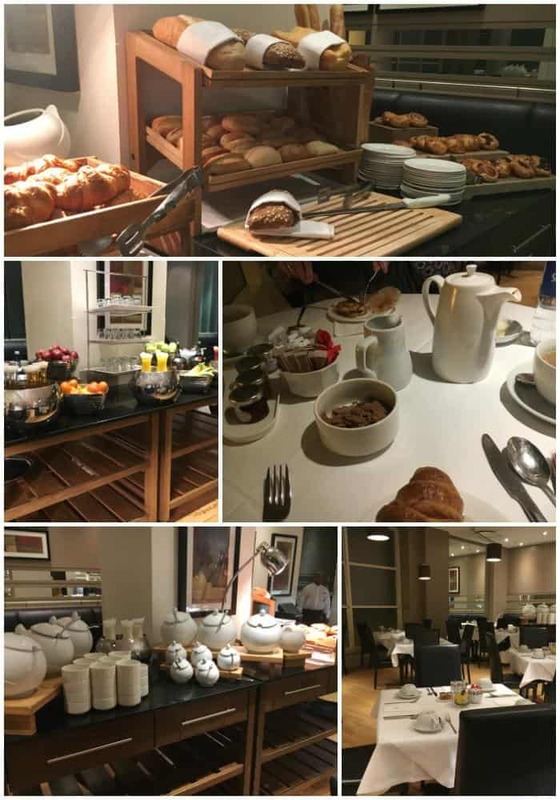 I would like to take this opportunity to extend a huge thank you to Sofitel London Gatwick for inviting us to their hotel and to the staff who made us feel so welcome. We had such a lovely experience and I would not hesitate in recommending staying here to family or friends. 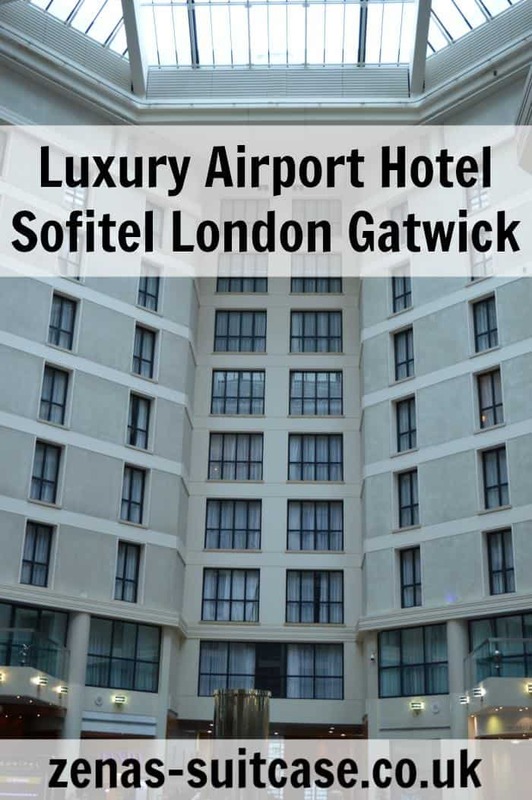 We were invited to Sofitel London Gatwick Hotel in return for this review but all thoughts and opinions are my own. This looks like a great hotel and a very detailed review. Thank you for sharing it! I never stay in hotel airports but seeing as London airports are so far from me maybe I would consider it next time as it really does lovely! We love this hotel pre and post holiday. It delivers every time, relaxing ahead of a flight and a short nights sleep and on our return an extension to our holiday, a relaxed dinner and a drink or two rounded off with a normal nights sleep. The rooms are so comfortable we could easily outstay our welcome!! What a gorgeous hotel, it really looks a luxurious home from home. i too have stayed at this hotel and found it to be wonderful, the staff were amazing and the room so clean and calm. I would totally recommend it.